The large township of Soweto is well known for its dramatic, tragic and democratically historic background. This township was created for labourers that were located in the area for large mining companies that are in the surrounding areas. Soweto is called home to over 1.2 million people from all different types of ethnic and cultural backgrounds. There are predominantly five languages spoken by the occupants of this township, namely being isiZulu, SeSotho, Tswana, Tsonga and Xhosa. There are many neighborhoods or smaller suburbs within the township. These areas are separated into Braamfischerville, Sharpeville, Protea Glen, Pimville, Zola, Orlando, Dobsonville and Meadowlands to name a few of the areas. These areas are then subdivided into extensions to make it easier to navigate around the large township. The common home in Soweto is quaint, sometimes compact and often very functional space. The kitchen in particular, is made for a purely functional purpose. Plain countertops, plenty of cupboard and storage space for supplies and groceries, as well as a standard stove and double basin. What is a kitchen planner? A kitchen planner describes an interior designer who specialise in the planning, conceptualising and implementation of the kitchen in particular. The kitchen planner's goal is to achieve a gorgeous kitchen made and fitted with professional, stylish materials and appliances that satisfy the needs and wants of the client. This is all done by the kitchen planner in order to avoid costly do it yourself projects that might fail, as well as to avoid the consequences of a lack of professional knowledge on materials used in the kitchen. The planner must conceptualise what is available to the client through a combination of their budget and wants, to model the best kitchen possible. For example, the planner must clearly know what would be better for the clients Sowetan kitchen by deciding if the kitchen is suitable for a gas operated stove and oven or an electrical stove and oven. 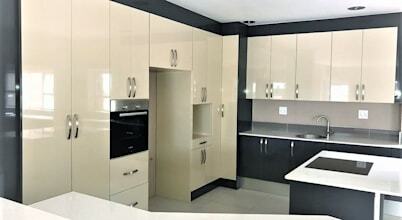 The standard kitchen in Soweto has two common features that is a must for these homeowners. First, there must be more than one window in the direct area of the kitchen. This is crucial due to the size of the kitchen and sometimes the location of the stove will direct where the window will be, to allow for optimal air flow in the room. Second, the kitchen will almost always have a door leading to the back of the house. These standard doors are also important as they might lead outside to another washing station or the waste bins. The door also serves as another entrance to the room and the entire house. How to choose the right kitchen floor? The typical Sowetan kitchen has many features, but let us focus on the flooring. There are many options available for kitchen flooring from all round tiling, whether it be glossy tiles or a sleek terracotta style tile. Other than tiling, the kitchen floor may be done with plain concrete flooring, a laminate wood specifically made for durability and an easy to clean surface. Another stylish option for flooring would be a stunning stone design. The stone design is quite popular as it lasts close to a lifetime. Lastly, the kitchen floor could be made from a classic wood, hardwood to be exact. This is found in quite old homes that were built a while ago, but this material is fast becoming a durable option for homeowners. What are the must-have kitchen appliances? Every kitchen needs appliances for it to perform its most basic functions. Every kitchen planner has a list of must haves for a basic modern kitchen especially in a modern Sowetan kitchen. There are tons of appliances that are becoming more popular to install and popular because of their decreasing prices. For example, the more affordable option for most modern middle class homeowners is a ceramic four plate stove. These are very affordable and easy to keep clean and cost between R2500 to R4000 for purchase, delivery and installation. Besides the stove, the modern kitchen usually has a kettle and toaster an a microwave. These three items are most commonly bought together and are usually matching colours or materials. Along with these three items, is one of the most important appliances that a modern kitchen will need; that is a fridge. Refrigerators can cost anywhere between R2000 to R15000 depending on the functions and size of the fridge. A refrigerator can perform many functions, but modern fridges need to perform certain tasks that are definitely needed for a modern home. A fridge needs to have a top and bottom section, the bottom is the freezer and the top is the fridge section. Most have a water or ice dispenser that can come in handy.